Well presented quad house in Villamartin that comprises 2 bedrooms, 2 bathrooms, living/dining room, kitchen, terrace and a large private solarium with fantastic views of the communal pool and Mediterranean Sea. 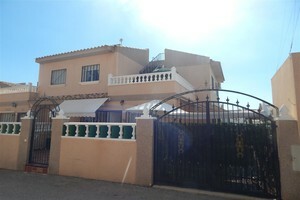 Built on a plot of 146 sqm with off road parking space, storage room and garden area. The property is in perfect condition and includes furniture, white goods, air conditioning units, fireplace, solar hot water, mosquito nets in every window and fitted wardrobes. Part of a gated complex with parking area, swimming pool and gardens with an ideal location, within walking distance to all amenities: La Fuente commercial centre, restaurants, supermarkets, bars, banks...The golf courses of Villamartin, Las Ramblas and Campoamor are very close and the beaches of Orihuela Costa are at a 5 minute drive.